Post-modernism is a big word, but is it relevant to Kenyans today? Surely it cannot be that big a problem in the country. While these may be the sentiments of some, I couldn’t disagree more. Yes, it is a big word, and it remains as such mainly because it may not be widely discussed, at least not in public spaces. The believer today is faced with many challenges in a world that is becoming increasingly hostile to Christ and generally to the things of God. society is changing… and has indeed changed from what we knew it a decade or two ago. People are becoming increasingly ‘aware’ of their ‘rights’ and moving towards a more individualistic society where ‘I’ decide what is right for me and what is true for you may not be necessarily true for me. Is this a western phenomenon that has slowly been introduced to the country? What is certain is that it is here with us, and it is here to stay. The advancement in technology and education, bringing about the ‘liberation’ of the mind or whatever you may call it requires us as believers to carefully consider our response to and engagement with the changing or the ‘changed’ world. Nothing is as it once was, at least not the absolutes. Everything is put under scrutiny, including the very Word of God and the doctrines we hold on to, and it is therefore not enough for us to carry on with faithfully attending church services and fellowships as if nothing is happening ‘out there’.We must be aware of what is happening outside the confines of our evangelical circles, especially where issues of faith are concerned. Truth is questioned, even the very truth of God. Are we still talking about Kenya? What has that got to do with me? Everything, and I mean, everything. While it may seem easier and maybe safer to lock ourselves in and hold on to our ‘personal’ faith, we need to be a voice, a voice of reason and help those who may be caught in this web. Sadly though, it has been noted that Christians respond to issues emotively or ‘spiritually’ without much information. Yes, emotions do flare when what we hold on to is questioned, but we have to engage issues head on and rationally so. This is why it is even more important for us to be rooted in the Word of God and to give ourselves to the diligent study of the same, acknowledging that it is not our head knowledge or fluency that will liberate but only the Word of God. How equipped are we to respond to post modern trends in the society? And how firm is our faith in such times? 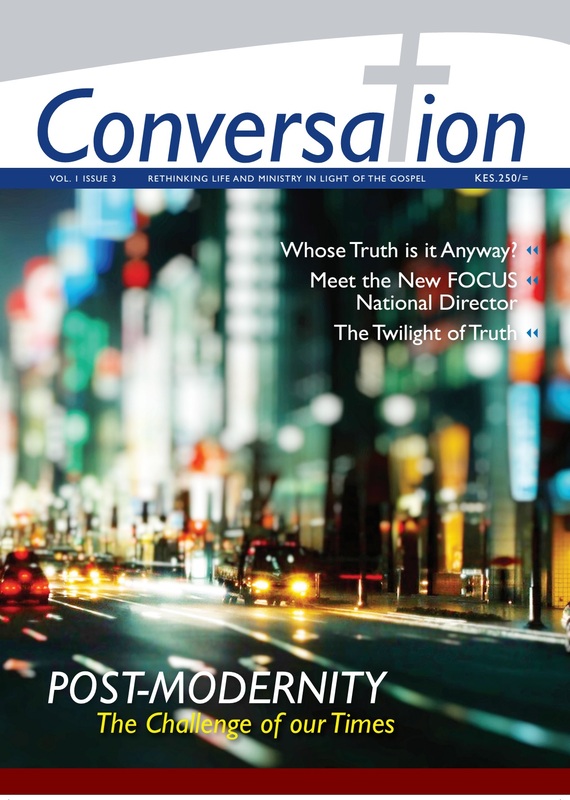 This issue of Conversation Magazine is packed with articles that will help us answer these and more questions as well as learn how to respond to post-modernism in our world. Also look out for our regular columns: Dig Deeper, Get the Bible Open, among others. Kindly do drop us a line as we value your feedback and would love to hear from you. To do so kindly reach us on: conversation [at] iserveafrica.org or comment below. 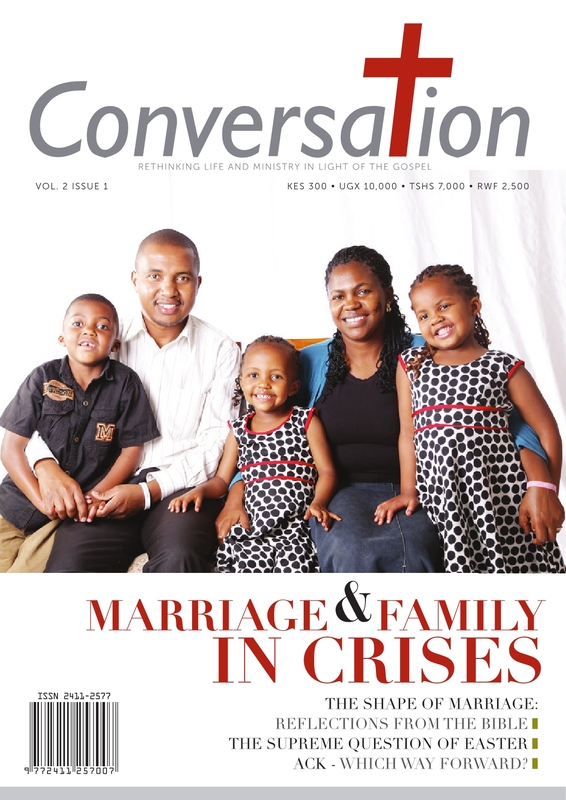 Get your copy of Conversation Magazine issue 3 for KES 250 from iServe Africa conferences and events, from iServe Africa Bookstore or from selected Christian media outlets including Keswick Books & Gifts, Evangel Publishing, ACTS bookshop, the All Saints Cathedral bookstall, Theovision and Fish FM. You can also download an e-copy of CM at Lulu for £2.00 or the equivalent. ← Raising the Bar – Which bar?